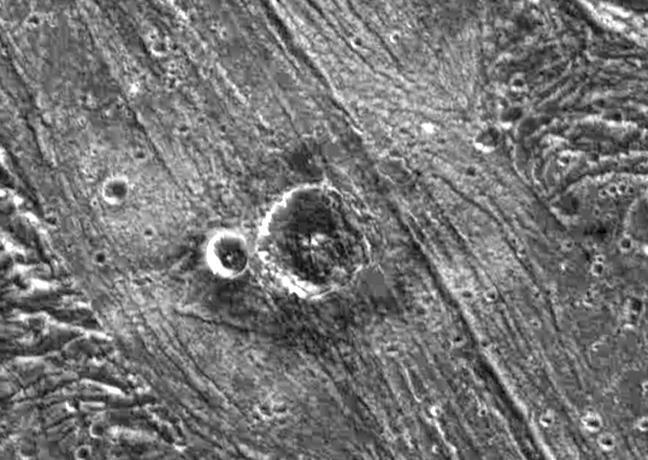 Two impact craters surrounded by an unusual ejecta blanket dominate this high resolution image of the surface of Jupiter's moon, Ganymede. NASA's Galileo spacecraft imaged this region as it passed Ganymede during its second orbit through the Jovian system. North is to the top of the picture and the sun illuminates the surface from the southeast. 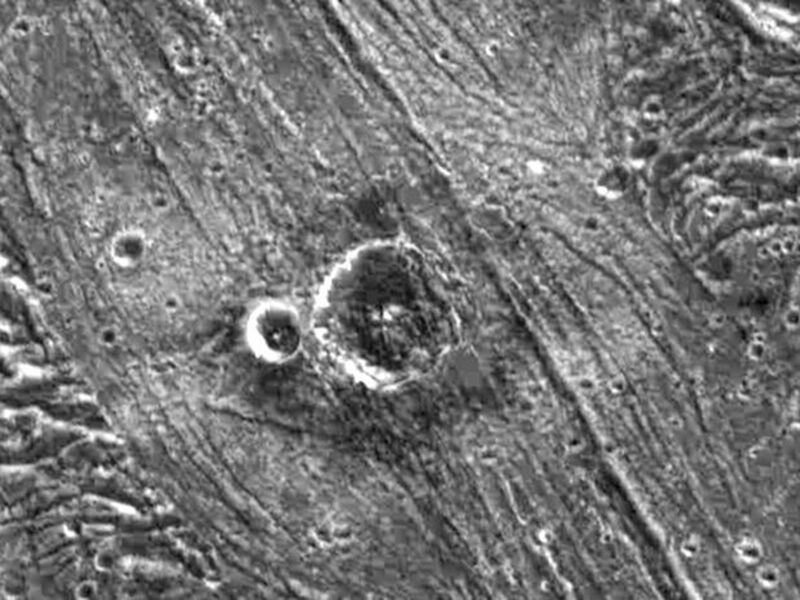 Nergal, the larger crater, is about eight kilometers (five miles) in diameter, while the smaller (unnamed) crater to its west is three kilometers (1.8 miles) across. 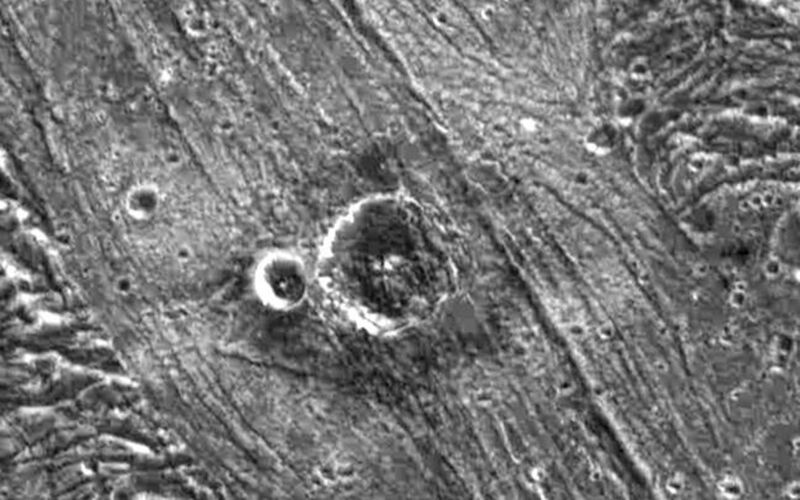 The craters are situated in a region of bright grooved terrain named Byblus Sulcus, located in the northern part of Marius Regio at 39 degrees latitude and 201 degrees longitude. The distinctive ejecta blanket that surrounds them is darker nearer the craters and brighter further away. 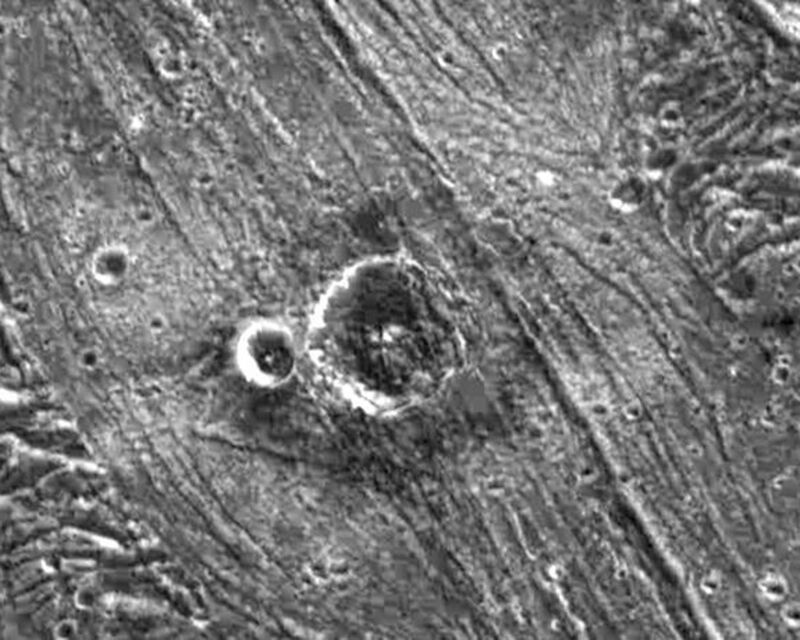 The inner region of the ejecta is characterized by a lobate appearance indicative of the flow of a liquid (or slushy) substance over the surface. The flow was probably icy surface material melted by the energy released during the impact that formed the crater. The picture covers an area about 48 kilometers (30 miles) by 34 kilometers (21 miles) across at a resolution of 86 meters (287 feet) per picture element. The image was taken on September 6, 1996 by the solid state imaging (CCD) system on NASA's Galileo spacecraft.